The first few weeks of any property development will give you more highs and lows then a night on the Las Vegas strip, but for us the first week definitely felt like we were on a losing streak. In the first three hours of being on site the front wall, bathroom ceiling and loft all looked as though they were about the collapse. With only a £2,000 contingency fund in place it was almost completely gone on day one, just in damage limitation. It’s hard to be able to predict everything, especially when you’re dealing with houses that were built over a century ago, but I certainly hadn’t seen any of these hurdles coming. Luckily for us after the first week of endless nightmares and sleepless nights the project quickly turned around with the biggest high coming from the removal of the living room wall. Our fantastic builder Harry Capehorn from Capehorn Developments, stripped, plastered and completed the first electrical fit in under two weeks. His team of experienced professionals helped us make some difficult decisions on site, finding affordable solutions for all the disasters we’ve faced. 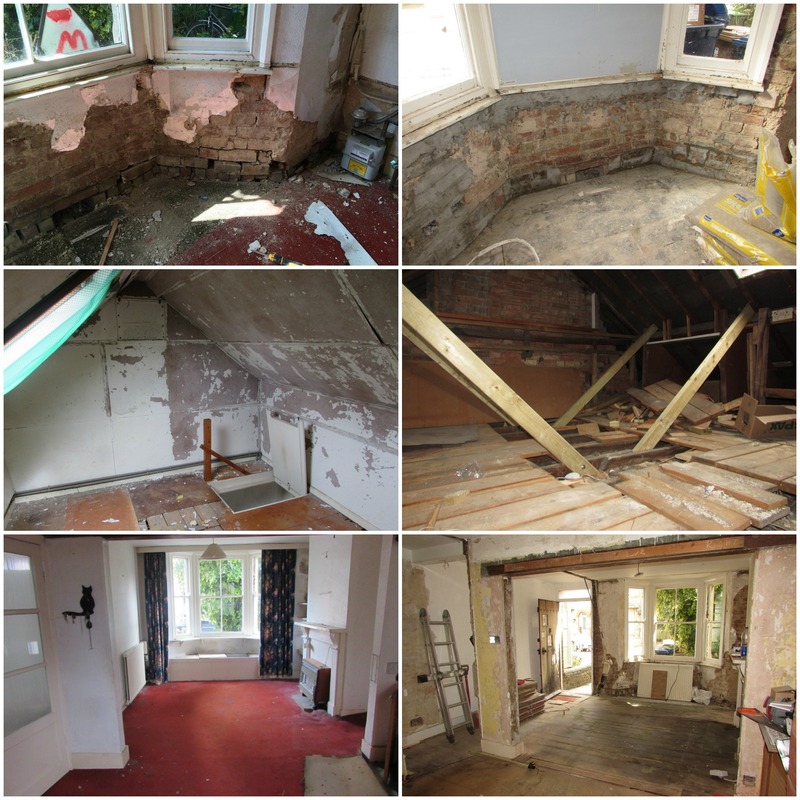 After repointing the front wall, re-joining the roof to the original building and restabilising the loft supports we quickly raced to get back on track and within the first two days had stripped the house entirely. The next step was the first electrical fix. 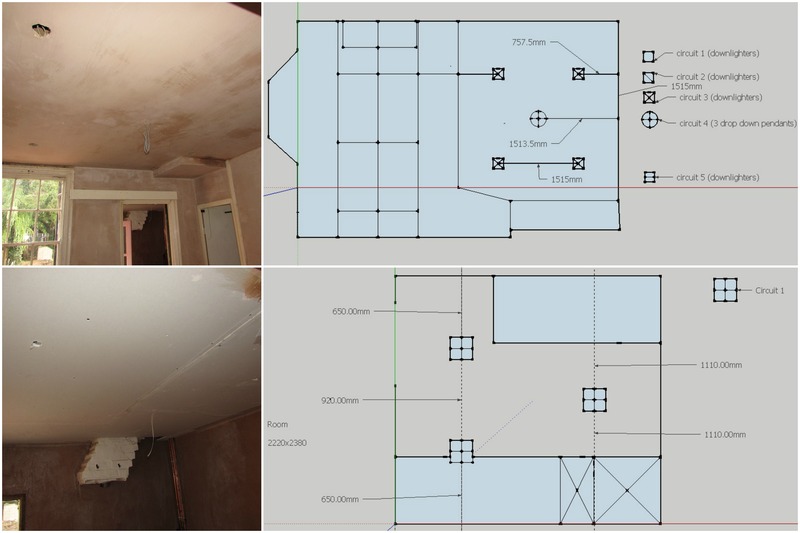 Electrical and lightings plans should be done well in advance and thought through thoroughly, as the circuits you choose, light fittings and socket placement, can not only practically change a room but atheistically it can transform it. Lighting plans especially are one of the most important aspects when planning a scheme, as you can light up wonderful masterpieces and set the mood for a romantic evening in with just the flick of a switch. This first fix became somewhat of a challenge for us as the joists in the ceilings just wouldn’t match up with my perfectly aligned plan. After an hour of reshuffling my perfect symmetry, I had to make a couple of compromises with the existing structure, bringing all of the dining room spots in by one inch. It’s important to remember when spacing spot lights and pendants that the flush of light given by each source will be different, so consult with you lighting provider before measuring out your scheme. LED’s are also a fantastic investment, and now with warmer tones available on the wider market they don’t necessarily have to break the bank, however always check the colour once lit before purchasing, as ‘warm white’ might end up being a lot brighter than your previous halogens. The most refreshing thing in the skip so far was all of the electrical trunking we ditched after my very clever electrician rewired the house. Planning on where to put your sockets, TV aerials and telephone wires can be time consuming, confusing and a bit dull, but practically it’s very important. I like to stand in the space and envisage the tasks I would do on a daily basis and place them accordingly. It’s also important at this stage to have completed your furniture plan, so the sockets can be hidden or strategically placed for more tricky appliances like floor lamps. Often electricians or builders will happily do the plan for you but I would always suggest you go through it point by point yourself, as no one knows your daily routine quite like you do. 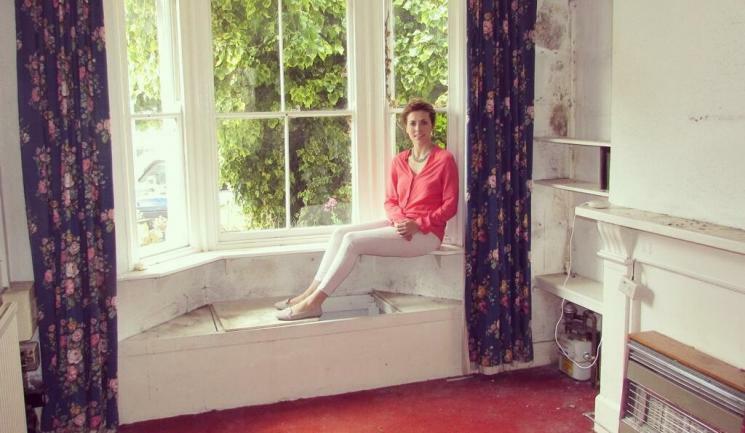 After stripping the walls the plastering can begin but when plastering an old house, especially if it’s suffered from damp or subsidence, there are many clever techniques you can adopt to prevent future cracking or staining. Throughout the whole house we decided to first layer the walls with a fiberglass mesh as it’s incredibly strong yet flexible, and will reinforce the walls preventing future cracking. On the front wall that had tried so hard to fall down, we repointed some of the bricks, concreted over them and then added a waterproof layer of plaster before adding the fiberglass and top coat. We did this to prevent any damp from coming through from the outside wall, and where the ivy had eaten into the brick work there was a higher chance that we could be effected by damp until we repoint the whole of the front. Plastering can take some time to dry so if possible air the house by opening some windows and doors, because if the property isn’t properly ventilated after plastering some areas may be affected by mould. As we spent most of the weekend clearing rubble from the garden, come Monday most of the walls were dry, there was just one slightly fuzzy area on the ceiling where a leaky radiator had dripped through causing the plaster to mould slightly. After some damage control from our plasterer, and some better drip management on our part, the ceiling was ready for another coat.